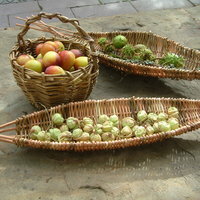 Learn techniques of twining and simple looping, making a connection with basketry and textiles. Work around simple moulds to make samples using both techniques and achieve an understanding of how to create woven structures, using a range of fine flexible materials. The focus of the making will be working around a mould, which either becomes part of the finished piece or is removed to leave a hollow form. Twining requires the weaving of an active element around a passive warp. The weaving is worked in the hands with the use of a few simple tools. Looped stuctures are formed using loops with either the fingers or a needle. The resulting fabric can be either tightly worked and therefore firm or loosely worked and more fluid. Working around simple moulds, samples will be worked using both techniques. You will be encouraged to work with a range of different fine flexible materials, all of which will have their own qualities. This will provide a variety of results when moulds are removed. Some of the moulds will be incorporated into the piece, meaning that the work almost covers the mould, for example working around a pebble. Mary will demonstrate techniques, provide visual notes and offer individual support to enable you to create your own decorative pieces. By the end of the course you should be confident with the basics of the technique of twining and simple looping. 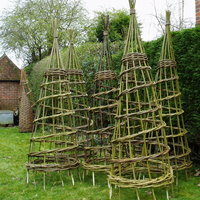 Also have an understanding of how to work around different forms to create a woven structure. The course will highlight the differences in materials and their characteristcs. Tools will be available on loan if required. Please wear covered shoes in the workshop. 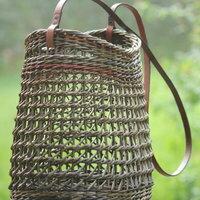 Mary Crabb is an award-winning contemporary basketmaker. 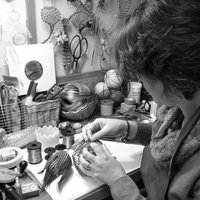 Having originally worked in willow, Mary now works with fine flexible materials, both natural and man-made, to create small, detailed and decorative woven forms exploring the connection between basketry and textiles.